NIOA, Australia’s largest firearms and ammunition supplier, has been awarded a $100 million contract to supply 155 millimetre Lightweight Towed Howitzer ammunition to the Australian Army. Defence Industry Minister Christopher Pyne congratulated NIOA on the contract award, saying it would help create up to 22 new jobs. “NIOA’s partnership with Rheinmetall Defence, their subsidiaries and Junghans Microtec, demonstrates the innovative approaches embraced by Australian companies to ensure our military is equipped with the best capabilities in the world,” Minister Pyne said. The deal will see NIOA create 12 new jobs over the next two years while the ammunition is qualified, and up to 10 more jobs in the domestic assembly of training ammunition. “This is an exciting new market for Australian defence industry and we hope after successful qualification of the ammunition, industry can start making the training rounds locally,” the Minister added. He said NIOA was also looking at additional opportunities for domestic manufacture of other types of 155mm ammunition. 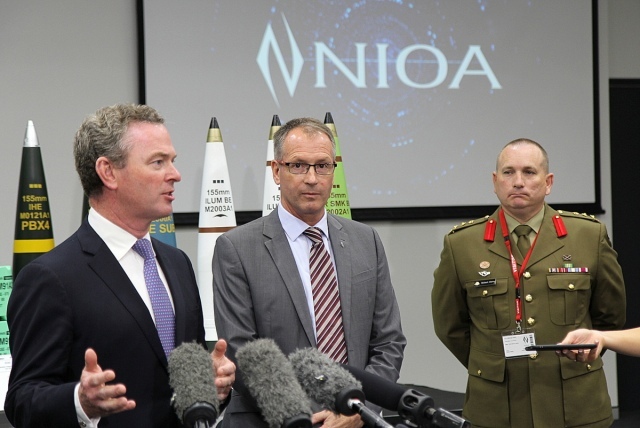 “This follows my announcement in November last year where I congratulated NIOA on winning a separate contract worth $95 million to supply more than 30 different munitions over the next five years to the military,” Mr Pyne concluded. Founded in 1973, NIOA is Australia’s largest privately-owned company supplying weapons, ammunition and technical support to commercial, military and law enforcement markets. The company operates from a purpose-built facility adjacent to Brisbane Airport which includes a state-of-the-art indoor firing range enabling weapon and ammunition testing in controlled conditions.